Growing businesses will be happy to know that GetResponse is now evolving into more of an all-in-one marketing solution rather than solely an e-mail marketing platform, which means it offers added perks like CRM and webinar functionality. They’ve got a sizable offering of over 500 e-mail templates and 1000 free stock photos to choose from, plus a fun and intuitive drag-and-drop editor for you to customize the templates however you’d like. It also shines in the split testing and list segmentation department – a feature particularly important for advanced marketers. GetResponse is your one stop shop for all your email marketing needs. 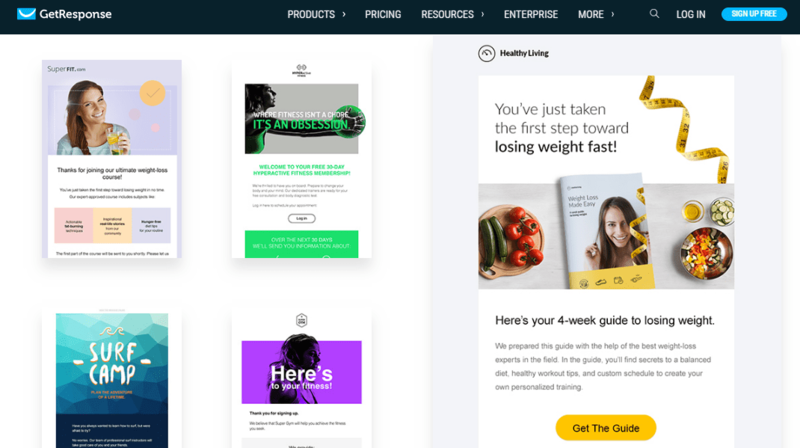 With plenty of fancy features, useful tools and hundreds of great looking templates, you can easily get your email marketing campaigns off the ground. If you are a newbie, no worries, GetResponse have a fantastic editor that is user-friendly and intuitive, enabling you to build the perfect email to wow your database of contacts. With free iStock photos, a QR generator and social integration you are in safe hands. Why Send Emails With GetResponse? Check out why GetResponse will bring you the results. Templates! Templates! Templates! & More! When we dig deeper into the templates and designs that are offered by GetResponse, its worth getting excited about because you are looking at premium quality templates, and over 1 000 free Stock photos. Dig into each category to get a taste of how GetResponse will knock your email marketing socks off. Customization: Bar none, the most fun, simple and enjoyable template editor we have had the chance to review. The GetReponse editor is easy on the eyes, all the tools necessary are easy to find and understand. it has the feel of a professional platform without being cumbersome. We were dragging and moving the text boxes and images without a hitch, making changes to the size right inside the template, no number or pixel adjusting, just straight forward easy editing right off the bat. Not only is editing the email template easy and enjoyable, but creating signup forms to match, adjust and incorporate to your site are just as easy. The signup forms are the place to acquire your subscribers, and you need something attractive to get their attention. In just a few quick clicks, you’ll have just as equally nice a signup form as you did with an email template. Template Selection: The GetResponse team has hundreds of templates & sign up forms for you to choose and easily customize. The email templates are organized into easy to find categories to help you find the perfect design to fit your email marketing campaign needs. 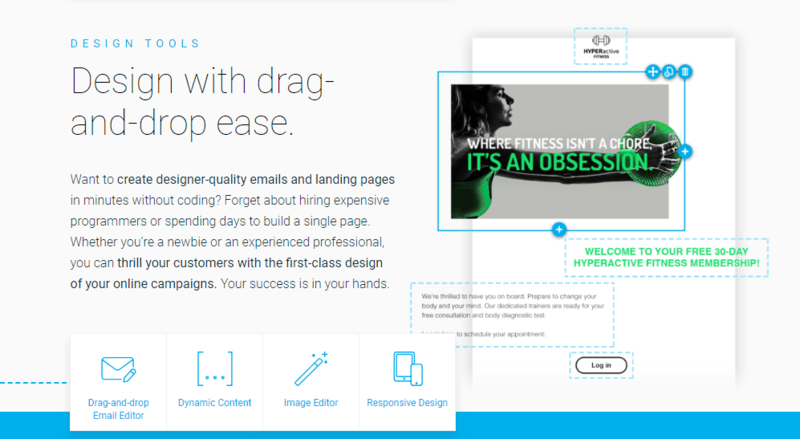 GetResponse offers hundreds of email templates and the same amount of signup forms. You need to capture subscribers, and what better way than with an appealing sign up form. We were delighted while sifting through all of the template options and customized signup forms that GetResponse offers. Premium quality templates guaranteed! Multimedia: Spicing up your emails with pictures, videos and other media will instantly grab your subscribers attention and have them wanting more. GetResponse offers 1000 of FREE iStock photos for you to add to your emails, image and video hosting and even a QR code generator. Allow your subscribers to access your emails easier and faster when you insert a QR code to your website or emails. Impressed? So are we! GetResponse gives you the resources to create a media rich email, and to do it effortlessly. 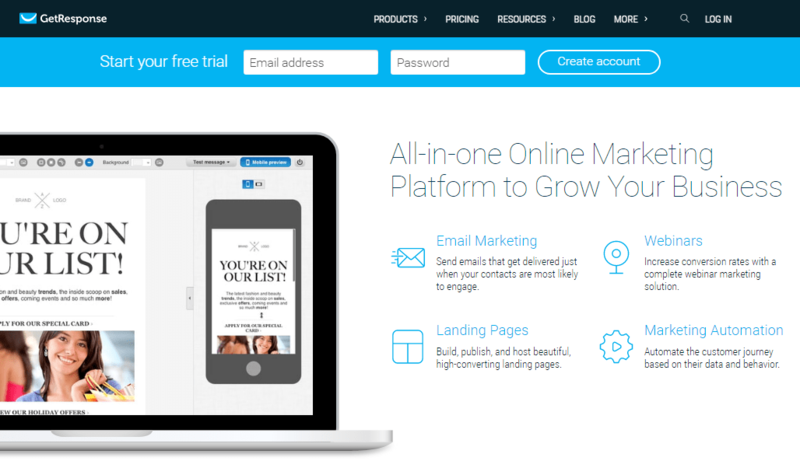 Everything you need to create and pull-off your email marketing campaign is on this platform. Extra features, such as the QR code generator and the list builder are included in the package. The list builder is an excellent way to reach a new and relevant audience thru email leads on GetSubscribers. Pay per lead and watch your list grow over night, this feature is worth every penny! The smart technology keeps emails out of the spam or junk folder and delivers results. To find out more about this feature, you can read more here. No matter the pricing package you choose, all the features are included. There is nothing complex or confusing about using GetResponse, as everything has been designed with the user in mind. You will find the editor a breath of fresh air, with hundreds of professional looking templates to get you on your way, with plenty of features, tools and flexible customization, so you pretty have everything in the palm of your hand. Editing is also made easy by the use of a drag-and-drop tool which will allow you to easily move and drop images, text and video around your chosen template. We give GetResponse major kudos on the incredible user interface and template editor they have created. When you have fun creating your email marketing template, it will shine thru into the emails you send. Let your subscribers feel that passion as you create, design and send out your newsletters. Two thumbs up and ten stars for user friendliness! We really can’t stop raving about the excellent service that GetResponse offers. Their phone number is listed for both in the US and abroad in the UK for internationals wishing to use their service. The learning center offers a wealth of knowledge to help get you started on learning the ropes of email marketing. Watch videos or read thru the FAQ find great insights to any questions you have. The videos are clear and do an excellent job explaining how to build your campaign, and outline useful tips & trips for the more advanced features on offer. There are 4 pricing packages, all of them are fully featured and paid on a monthly basis. Each package is based on how many subscribers you have on your list or plan to send emails to. This does mean that there is unlimited sending to subscribers each month. While we can’t stop raving about the great features and customization of GetResponse, we were extremely disappointed not to find a free for lifetime option. They offer an incredible service, however, compared to the other email services, that is an important feature for any person or business starting out. We think it is important to spend some time building a list, sending emails and really get a feel for the email marketing world before committing to a subscription. Three packages’ sizes and prices follow. The Enterprise Package -100,000 emails/month starts at $1,199/month. GetResponse has a great email marketing service for people or businesses of all sizes wishing to create an email marketing campaign from the ground up. We ended this review with a smile on our email marketing faces! Really impressed by the simplicity of the template editor and template selection, as well as the massive list of features. Whatever your level or knowledge of email marketing is, this is a great service. We recommend you go over and take a look for yourselves, and report back with anything you think we missed. Share your thoughts with us either in an email or on Facebook and Twitter.